While it doesn’t sound like a biggie, I can tell you paying attention to those little details when personalising an email makes a difference. It makes it an uphill battle if you are selling your professionalism and attention to detail but can’t get the name of the contact person - or even the company correct! I’ll admit it’s a struggle amongst the minefield of alternate spellings out there – Amy can also be spelled Aimee, Aymie, Amee, Amye just for openers - and while some names may seem like a random jumble of consonants with a vowel or 2 thrown in as an afterthought… please put in an effort to double check these, trust me - they'll appreciate that effort. The parents among us will tell you about the amount of rather creative new names out there - just try sending out a kids party invitation these days – good luck! Obviously, it’s respectful, and communicates to the recipient that you have taken the time to consider them, their request (or yours) and getting that basic opening line correct means you're off to a good start. 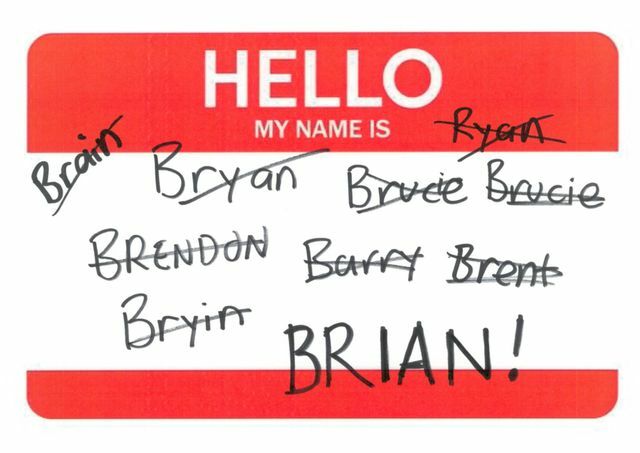 When I check emails on my phone I get a teaser of the first couple of lines and when it says “Hi Brain”, (or Bryan, Bruce, Brendon, Barry and a new surprise variation – Briyin) I'm half frowning before I've even got to the content! Spellcheck will not save you here. Poor spellcheck is struggling to keep up as it is! Even if you’ve added that name to your dictionary in the drop down for next time ( a good tip), still double check to make sure you have the right variation. No nicknames off the bat. If the person is called Matthew - start with that rather than 'Matt'… and certainly don’t come in hot with 'Matty'! No doubt everyone has their own stories, so feel free to share below!